We believe that providing a clean, safe environment is crucial for patients of all ages. Strict infection control standards are rigorously adhered to, and we are committed to meeting and exceeding the guidelines set by the Dental Council of Ireland and the Department of Health. 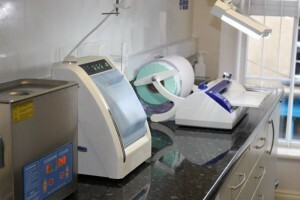 Our dedicated sterilisation area is among the most modern and up to date in any dental practice in Ireland. We are happy to discuss these procedures and facilities with patients if they require further information. Dedicated sterilisation area – By keeping our sterilisation area away from the clinical area, we minimize the risk of any cross contamination. Our dedicated sterilisation area is divided into specific zones to further reduce this risk. Disposable items – Wherever possible, disposable, one-time items are utilised at Quirke Dental Surgeons. Each clinical team member wears disposable gloves for each patient. These are changed regularly throughout your treatment, and at the end of your appointment. Hands are washed before and after each patient. Ultrasonic Treatment – All re-useable equipment and instruments are initially treated ultrasonically with an enzymatic cleaner to remove any large deposits. Thermal Disinfector – Instruments are then transferred to a thermal disinfector where they are subjected to intense automated washing, disinfection and drying cycles. Wrapping – After inspection, instruments are then wrapped in sets in specialised sterilisation pouches using thermo-sealing technology. Autoclaves – Sealed instruments are then transferred into our autoclaves, these machines ensure all dental equipment and instruments are sterile. 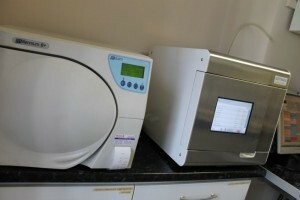 We use Class B vacuum autoclaves which are state-of-the-art in terms of sterilisation. All cycles are recorded electronically or by printout. Storage – The sterile packages are then transferred into storage areas. The entire sterilisation procedure for each instrument takes over 2 hours. 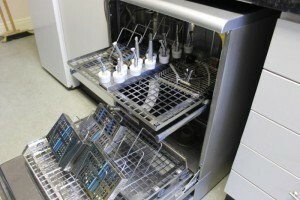 Sterilox – All water used in the dental units has been carefully treated. This ensures all bacteria contained within the water is eliminated and safe for our patients.